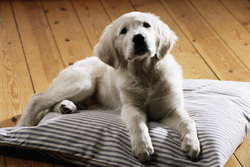 Prior to your puppy having their second injection he/she cannot use our dog walking service. However we offer a puppy visit service where we will feed, water, play, train, toilet and clean up after your puppy at your home. Visits last up to 30mins. Young dogs need extra care when being introduced to walking with a group. Older dogs in the group will help teach puppies and give them confidence. It is equally important that they get time to train with the new dog walker without too many distractions. 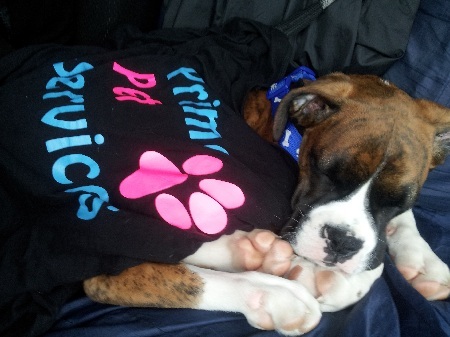 Primo Pet Services offers walking for puppies from 12weeks old. Walks are kept short - too much exercise at a young age can put allot of strain on immature bodies and affect growth. When very young, puppies will get tired quickly and an hour walk is unsuitable. Our puppy service will involve 20mins/30mins group walking with older, experienced and friendly dogs. 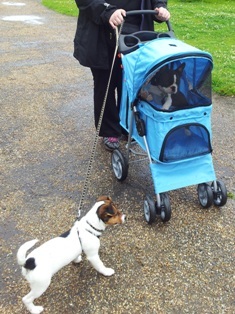 Primo Pet Services walks dogs in hourly blocks so for the remainder of the walk we use our puppy-pram. The puppy-pram is weatherproof, has a fly screen and keeps your puppy secure on a comfortable washable bed so that a tired puppy can still enjoy the stimulation of the walk without over exercising. This service is available for puppies and small dogs and costs no more than older dog walks. 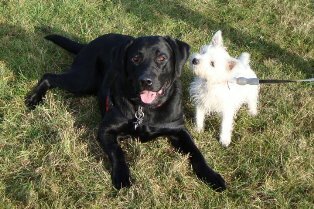 puppy, walking, walker, enfield, chingford, waltham abbey, dog, young, walks, professional, services, carer, visits, Primo Pet Services and Enfield and Chingford offer a puppy walking service for very young puppies.